Happy Monday everyone! Is it too soon to start planning what we'll be doing the next long weekend? I'm going to be cheering on the boy as he performs his mambo routine this Saturday night. "The Smirnoff Nightlife Exchange Project is an ambitious attempt to create a once-in-a-lifetime experience on the same night all over the globe. 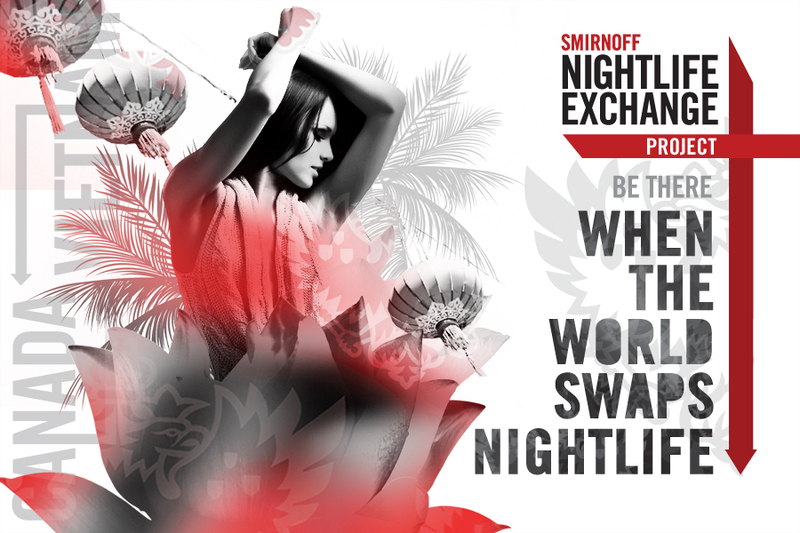 On Saturday November 12, Vancouver will host the Canadian Smirnoff Nightlife Exchange Project with a one-of-a kind Vietnamese-themed event taking place at the Salt Building in Vancouver, headlined by world-renowned Canadian DJ A-TRAK and Saigon’s DJ Jase. The Salt Building will be transformed to recreate the heart of Vietnam’s urban lifestyle where the hipster and Bui (street style) scene collide, including a Vietnamese market brought to life, with fresh food carts, a karaoke booth, a souvenir shop and a clothing market." Sounds incredible, doesn't it? To enter, all you have to do is leave a comment on this post by Wednesday November 9th, 12pm PST, with the answer to the question "After a night out, what's for breakfast?" Entrants must be Lower Mainland residents. All entries must have a means of contact (blog, email or Twitter account). Entries without a means of contact are automatically disqualified. Hi. Hmmm...I guess it would have to be cake. Because I like cake and it makes my tummy feel better after a night of drinking one too many cocktails. pancakes and maybe ice cream.. mmm..
After a night out, what's for breakfast? Breakfast after a night out? It's gotta be something greasy. Whether it's eggs, bacon and hashbrowns from a diner just down the road or an Egg McMuffin from McDonalds, I definitely need the grease to help me recover. After a night out I love Milestones French toast! Have a fresh batch of french toast! Breakfast after a night out is panfried potatoes and a benny! And of course a mimosa to top it off.